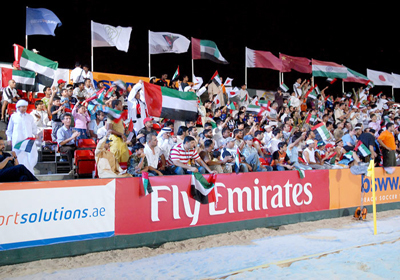 FIFA announced on Sunday that the United Arab Emirates will host the FIFA Beach Soccer World Cup 2009 in Dubai. The city has quickly become the sporting capital of the Middle East and the announcement further underlines that fact. At the same occasion FIFA General Secretary Jérôme Valcke presented that France will stage the 2008 competition in the city of Marseille, the first time in the event’s history that it will be held outside of its birthplace of Brazil. His Highness Sheikh Ahmed bin Saeed Al-Maktoum, Chairman and Chief Executive, Emirates Airline & Group, said: “Dubai is the perfect choice as the venue for the FIFA Beach Soccer World Cup 2009, it is through the vision of His Highness Sheikh Mohammed bin Rashid Al-Maktoum, Vice President and Prime Minister of the UAE and Ruler of Dubai, that the infrastructure is in place for the city to be able to hold an event of this magnitude. Emirates is very pleased that the FIFA Beach Soccer World Cup will take place on our home soil in 2009 and will provide any support necessary to make this a unique experience for all football fans from all over the world." “What's happened in the last three years since the integration of beach soccer in the FIFA family has been fantastic. I don't know if any other sport has ever made such rapid progress in such a short space of time – both on the pitch and in running the game. It is now a fascinating combination of organised football and lifestyle. By moving the event first to Marseilles and then to Dubai, we are convinced that we will be taking yet another giant step in the dynamic world of beach soccer, ” explained FIFA General Secretary Jérôme Valcke during the announcement at the occasion of the draw for the 2007 edition of the FIFA Beach Soccer World Cup in Marseille. Emirates is an Official Partner of the FIFA World Cup with close links to FIFA and all its projects in the 2007–2014 period. At the 2006 FIFA World Cup Emirates became the first airline to be an Official Partner of the world's premier football tournament. In 2004, Emirates and Arsenal Football Club signed the biggest club sponsorship in English football history - in addition to the Fly Emirates logo on the players' shirts, Emirates also has the naming rights of their new home, the Emirates Stadium. Emirates also sponsors Paris Saint Germain Football Club and Hamburger SV.